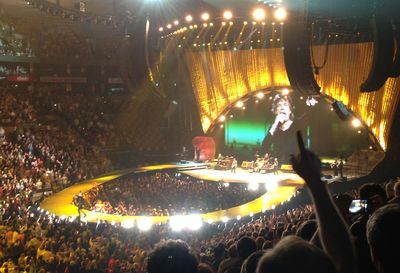 Last night, my friend Nick Morgan and I caught the Mick Jagger Show... er, the Rolling Stones... in Boston. It was a terrific show. Nick is my speaker coach, so we used the Stones show as a "field trip" to watch a master performer in action. And boy, is Sir Mick a master. There is no doubt that anyone who speaks in public can learn from Mick Jagger. As Nick says, "Any time I get a chance to see a legendary performer like Jagger, I jump at it, because it's a chance to learn stagecraft useful for public speakers." Jagger has stagecraft aplenty. He owns the stage from the opening numbers (Get Off of My Cloud and It's Only Rock and Roll) and never lets up, save a couple of numbers where he sits down to rest and lets Keith Richards sing and play. The Stones, the background singers, the choir, the other guitarists adding their bit, the horn players -- all of them are there to support Mick. What can we learn from this indefatigable performer? Jagger knows exactly where he is at every moment. There is not a wasted gesture, move, or step. He knows where the other Stones are, where the spotlight is, and most of all what the audience is doing. He's probably the most self-aware performer we"ve ever witnessed. He's a complete pro. So many speakers resist rehearsal because they don't want to get stale. Jagger shows how counter-productive that attitude is. It's all in service to the audience. Every gesture reaches out to the audience. Every step is toward the audience, when he's singing. And when he's not singing, instead of stepping back, he's working the thrust stage, interacting with the audience. His focus is unrelenting. It may only be rock and roll, but for Mick Jagger, it's business, and he takes it seriously. He rarely smiled during the performance, and the between-song chat is minimal. He's self-aware, but he's always focused on the audience. Music -- especially familiar music -- fires up the pleasure centers in our brains. That's why we like it. Watching Mick, we couldn't help thinking that he can fill a concert hall because music instantly brings pleasure. Speakers have to work much harder to achieve even remotely similar effects. Every speaker should seriously consider working music into his or her presentation, because it's a short cut to emotion. Have music underneath your intro. Work a song into a bit of video that you show us. Close with a song that's relevant to your message. Whatever the (relevant) way you figure out to bring music in, do it because it's an effective short cut to a strong, emotional connection with your audience. Mick Jagger is 69 years old. He told the audience that the first time the band played Boston was in 1965. Imagine that. And he's still got incredible energy. We've seen very few rock stars of any age who work a stage with such vitality. In a recent interview, Mick said: "I train five or six days a week, but I don't go crazy. I alternate between gym work and dancing, then I do sprints, things like that. I'm training for stamina." There's no doubt that being physically fit helps public speakers. You control your body better. Breathing becomes more relaxed. And you strut the stage without getting winded. We both want to still be active on the speaking circuit at 69 and like Mick, fitness will make sure we can do it physically. The Rolling Stones production is huge with more than a dozen 18-wheelers full of gear and hundreds of people backstage making things happen. At larger speaking gigs we've done, the technology can approach this level with dozens of staff for sound, lights, video, and staging. Yet most speakers don't take advantage of the opportunity to do a sound check. They don't meet with the production staff to discuss their speech. Instead they just show up a few minutes before they go on and wing it. Mick Jagger is totally comfortable with his technology and it was clear that he rehearsed with it many times. Although it was very difficult to see, we noticed he had a teleprompter available. As far as we could tell, he never needed to use it. But as a true pro, he knew where it was in case he needed it. The tongue stage was a terrific tool for Mick to get out into the audience. And over the course of the 2 hour and 20 minute show, Mick used the entire stage. But it was interesting to see that in the opening several numbers, he stayed in the main stage area. Then he ventured over to the sides for a few songs. Finally, about 45 minutes or so into the show, he went way out into the audience. In other words, he held back a bit in the beginning. Most public speakers either stand in front of the podium, or if they venture out, just hang out near the center of the stage. Some go back and forth to the corners like a metronome. True professionals work the entire stage like a rock star. Link to The Rolling Stones - You Can't Always Get What You Want - Live 1990 on YouTube.